"When I thought everything that could go wrong would, Whitney Bell and Wedding Bells & Events made sure it didn't. Unlike every other bride out there I had no idea what I wanted in a wedding (other than to get married!) and no idea what it would take to make it happen. Whitney tirelessly walked my mother, fiancé (now husband) and I through all of the details large and small. She helped us brainstorm, research, create, decorate and delegate. With Whitney's help what would have been a very humble affair became truly elegant. What could have been immensely stressful became a joy. Wedding Bells & Events was an absolute godsend. There's no one I would trust more with an event than Whitney Bell." "Whitney Bell was a wonderful wedding coordinator. She handled helping me with rehearsal dinner and weekend-of-the-wedding timelines and details. She also served as the coordinator at our rehearsal dinner, worked with our church's wedding coordinator for the ceremony, and also coordinated our reception. She worked diligently to ensure that things went as I had envisioned. She is an advocate and makes things happen!... From giving direction to wedding party and family members to ensuring reception music, etc. is as the bride and groom want it to be, she is a coordinator who cares about her clients and works hard to make the long-awaited day less stressful and absolutely enjoyable. We received numerous comments about how well everything went. I recommend her for your event. She and Wedding Bells & Events will be a blessing!" "Whitney was such a pleasure to work with! Our VIP Event at Wet 'n' Wild SplashTown was a HUGE success thanks to her hard work and dedication. She was so accommodating and was able to meet with us around our busy schedule. All the vendors she recommended were fantastic and she was happy to work with new vendors that we were interested in. Whitney was able to help us coordinate all of our vendors and keep us within our event budget. She also handled all of our last minute requests and changes without skipping a beat. Everyone she crossed paths with at the park loved her, and I would highly recommend Wedding Bells & Events for anyone planning any type of event." "Planning a wedding is such a time consuming and tedious task! As the big day approached, Whitney Bell was a tremendous help! As our Day Of Coordinator, she stepped in as if she had been planning our wedding all along. She was available when we needed her, very thorough, and made sure all of the details were in tact. Up until the end of the night she was available, calm, and ready to work! Without Wedding Bells & Events I have no clue how things may have gone the days leading up to and the day of our wedding. She is who we chose, and we would recommend her for your next event!" "Whitney did a terrific job for my wife and I. She was calm cool and collected even through the most pressure cooking times of our wedding. Her competence about wedding planning was clearly evident. And she was very good about contacting us when she said she would. Overall she made our wedding planning and our Wedding day joyful. I would encourage anyone who wants a wedding planner who will do a great job and actually care about the people she is serving instead of just treating them like another item on the to do list, to seriously consider using Wedding Bells & Events for their next event." We would like to thank our clients Ij and Nike for this video testimonial courtesy of Ola Photos! www.olaphotos.com Check it out below! 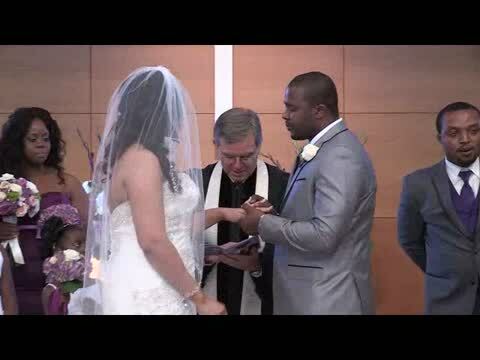 "Whitney served as our wedding coordinator for our beautiful, multicultural wedding. I was in search for someone who would understand my vision of a simple but classy wedding which would incorporate both my husband’s and my culture equally, and without too much explanation. Whitney understood my every request and filled in the gaps in areas that I was clueless. She is very organized, paid attention to details, and my fiancé( now husband) and I were both able to relax once she came into the picture. We had no worries on the wedding day. She tied a lot of loose ends for us. Whitney was just awesome. She was calm, collected and very promt. She even made the centerpieces we used, and they were beautiful. Whitney made herself available to me at all times of the day that I has questions about the planning process. She was just awesome. Thanks Whitney for making our day run smoothly and adding to our special day!!! I would recommend Wedding Bells & Events to everyone I know!!! Thank you!!!" Kwame & Loretta Bennam, married 05/09/2015.